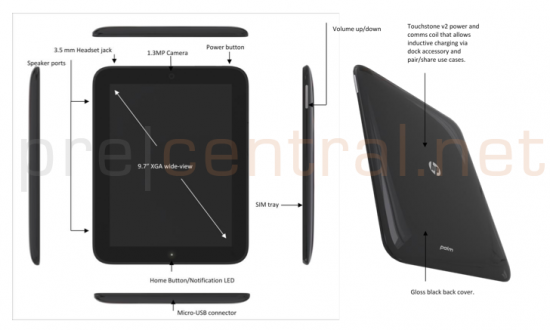 We've received a massive document detailing HP's plans for the Topaz webOS slate from last year. While these details aren't final, what we know is that HP is planning to make the Topaz highly competitive with the iPad from both a hardware and a software perspective. We've got a better idea of the specs, we've got prototype photos, we've got plans, and plenty more. Oh yes, you want to click that Read More link right now. It looks like HP is going with the Qualcomm MSM8660 processor clocked at 1.2GHz rather than the new hotness coming from NVIDIA (however we did see one random NVIDIA logo in the document, take that for what it's worth). However, there probably won't be any flies on that 8660, as it sports two scorpion cores in the Snapdragon-based processor. 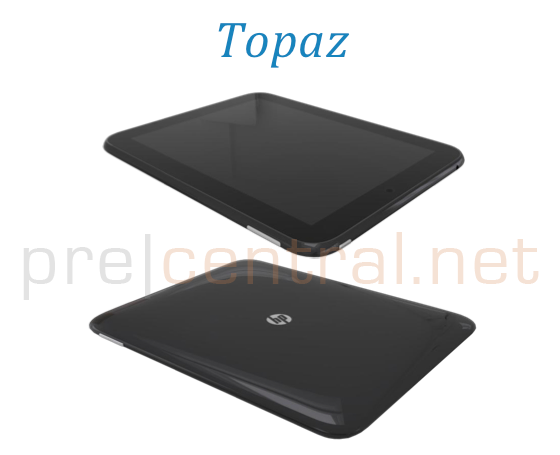 The Topaz will be black with both the HP and Palm branding. They also intend to get the Beats audio branding on the device as well, at least in the software and likely on the hardware as well. Finally, they haven't closed the door on carrier branding for the 3G and 4G versions. As far as buttons go, it looks like there will be precisely three: power, volume up, and volume down. There will be no silent / ringer switch - you will mute the Topaz by holding down the volume-down button. There will also be ways to reset and hard-reset the device by holding down various button combinations. The Topaz will have webOS's notification light. Beyond that we have specs that aren't necessarily awe-inspiring. A 1024x768 screen filling out 9" behind oleophobic Gorilla Glass, 512mb of RAM, and three storage options: 16g / 32g / 64g. The board will support 128gb of RAM, but it doesn't appear like that will be an option at launch. There will be one camera on the front of the device clocking in at 1.3 megapixels. Said camera will be used for video chat and "mug shots" and HP dearly hopes that they will be able to enable video chat beyond just webOS-to-webOS devices, including support for Skype and Google Talk. The camera will be at the top when the device is in portrait mode and won't have a status light. They won't make a version without a camera. The Topaz is currently targeted to have a WiFi-only version as well as HSPA and LTE options with CDMA coming later. Both the HSPA and LTE versions will likely be SIM-locked but it will be possible to unlock the SIM card for use on alternate networks. The HPSPA bands will be 850, 1900, 2100 MHz with support for quad-band EDGE. The Topaz will use a full-size SIM card via a pop-out SIM tray. They won't be supporting NFC. It looks as though the 3G and 4G versions will have A-GPS but it doesn't look like the WiFi-only version will. On the versions with a radio, it looks like HP fully intends to support SMS/MMS on the device itself (and presumably still intends to support the text-message forwarding and call-forwarding we previously discussed). Although it wasn't nailed down at the time of this document's writing, HP was definitely aiming to support USB Host so you could plug a digital camera into the Topaz and be able to import and edit your photos on the device. The Topaz will support Touchstone inductive charging - but obviously it won't work with the current Touchstone. Instead, HP is developing something they were calling "Touchstone v2" that supports additional functionality. 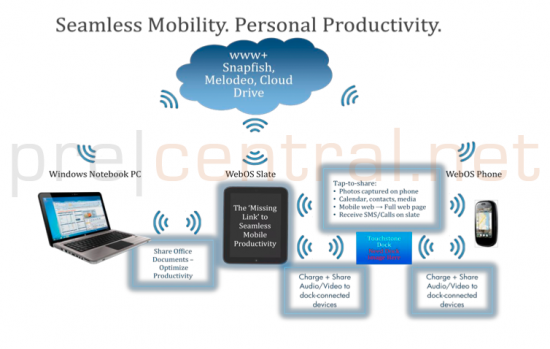 That functionality looks to include both Bluetooth for wireless streaming of content and speakers for music. That last is intriguing. The idea is that you can start watching a movie on the dock, but when you lift the Topaz out of the dock it switches into a wireless remote to control the video that it's wirelessly streaming to the controller for play on your television. As of last fall, HP was hoping to include a 3-axis Gyro for gaming. That last, the "Cloud canvas" is new to us and details are still thin, but we suspect it will be the technology behind the ability to easily share documents and other content between multiple devices. HP also has an existing partnership with Rhapsody that may or may not find its way onto the Topaz. We've heard previous rumors that HP is looking for heavy integration with Amazon's services for music and video, so that's unclear as of yet. Fully supporting Flash is a very high priority for HP as it will be one of the key differentiators between the Topaz and the iPad. It may also be possible that they will support Adobe Air apps, but it's not clear if that's possible yet. HP is also making space for carrier customization as well. So that's the Topaz - or at least HP's plans for the Topaz as of last fall. 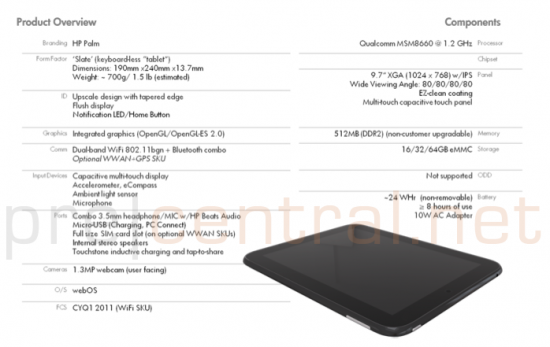 A dual-core Snapdragon processor powering a 9" 1024x768 screen in a form factor designed from jump-street to compete with the iPad. It will bring serious Touchstone v2 integration as well as plenty of cloud integration. The Topaz should share both HP and Palm branding. It looks like it was a project that HP started way back in April under the codename "Marble" before they began the work of switching it over to webOS in July, after the Palm acquisition. As late as last fall, HP was targeting betweek 400k and 1.5 million unit sales for the device and has been targeting a CES 2011 launch for some time as well - a launch they smartly moved away from the event itself.